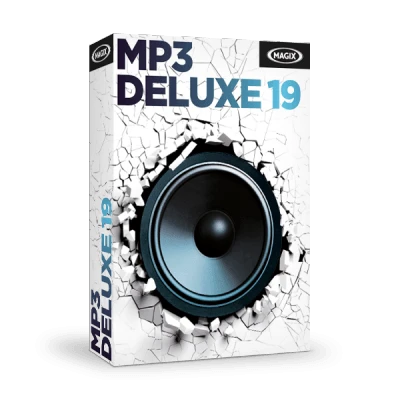 Audio editor, MP3 converter & digital jukebox all in one: MAGIX MP3 deluxe 19 guarantees first class musical entertainment. Enjoy your music library on your PC, tablet or smartphone. Enjoy your music in an entirely new way thanks to a brand new design. Organize your digital music collections, convert audio files, create playlists, discover new artists, songs and entire genres from listening to web radio: MP3 deluxe 19 is a first-class entertainer with many talents. Press Play and take a break from the world. Listen to your favourite songs and artists over your stereo system or computer speakers. Just the right file format: With MP3 deluxe you can convert your audio material to high-quality formats, for instance from WAV to MP3 or AAC. Select the songs most near and dear to you. These will automatically be turned into a playlist of your favorite songs. A multitude of amazing sounds: More than a thousand web radio stations in all sorts of genres are just waiting to be discovered. The music stops playing as you're beginning to dream. The sleep timer shuts down your music and your PC too at a fixed time. An advanced design with well thought-out control elements: The new interface makes listening pleasure the priority. Your music, everywhere: With MP3 deluxe 19 you can transfer songs, albums or entire playlists quickly and easily to Android and Windows smartphones or tablets. Use CD covers from the Internet, or design your very own. The new Print Studio creates booklets and title lists automatically from your playlist. Optimized speed: With the integrated Audio Editor it's easy to edit and cut audio files and remove noise interference. Burn to range of disc formats: The new routines optimize CD, DVD & Blu-ray disc burning – without influencing the quality of results. In MP3 deluxe 19, the format and support for AAC files* has been considerably improved. This allows for unlimited enjoyment of your music. Got music for every letter in the alphabet? MP3 deluxe 19 has the solution: Sort your collection alphabetically according to genre, artist or album with just one click. Songs can also be ordered according to track length. From sporty to romantic: Create playlists for different artists, genres, and moods. It's easy to transfer media to smartphones, so you can even listen to your playlists while out running. Infinite options: Get inspiration from the 3D music universe for a whole new way of sorting your songs, albums and artists! Edit your audio material with high-quality studio effects. Enjoy your catalog in brilliant sound quality thanks to the compressor, an equalizer and special settings for headphones. Internet connection: Required for activating and validating the program, as well as for some program functions. Software can also be used offline. With MAGIX Music Maker you can make your own songs in a flash without the need for any previous music production know-how. You can organize your songs afterwards in MP3 deluxe. Transfer all your audio files to Audio & Music Lab Premium and optimize sound the professional way. With just a click you can use your audio files in your videos with MAGIX Movie Edit Pro, MAGIX Video Pro X, MAGIX Photostory or MAGIX Fastcut.